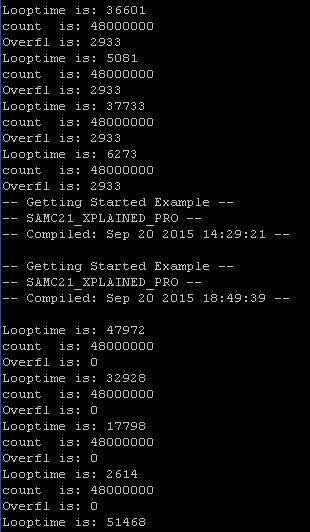 » SAMC21 32-bit timer not counting more than 16 bits. SAMC21 32-bit timer not counting more than 16 bits. 16-bit timer works fine, hits the overflow callback. When I change to 32-bit only 16-bits of the counter is used. I used the setup from the "TC UNIT TEST". 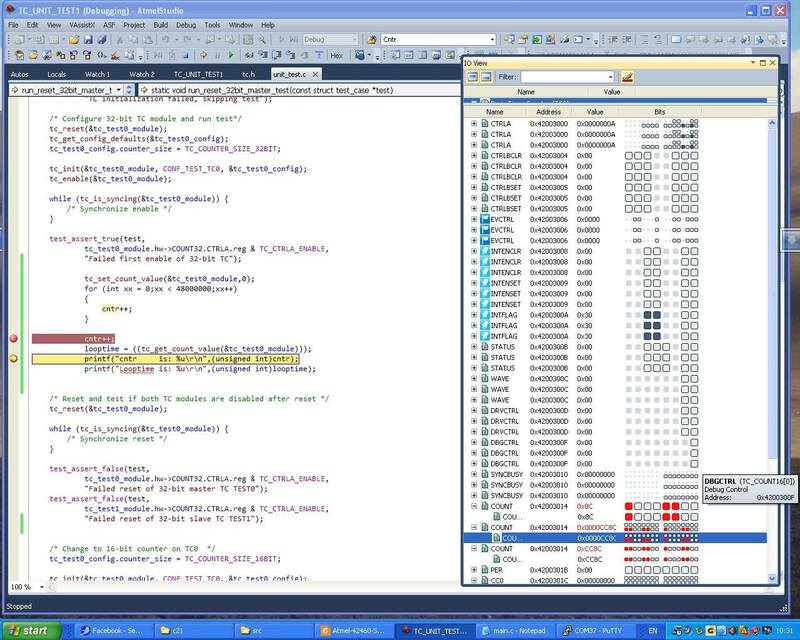 in the debugger screenshot to follow, you can see that TC0 is enabled & set to 32-bit. When I print the value it is only a value that would fit iin 16-bits. also note that on the right the i/o register for the 32 bit count only show values in the lower 16 bits. Here is a picture of the output. The top half is with a 16-bit counter and counting the overflows in a callback. The bottom halt is the same program, only changed the timer counter size. I am reasonably certain that the SAMc21 is not counting more than 16 bits. Here is a screenshot of the debugger. I have circled the items of note. 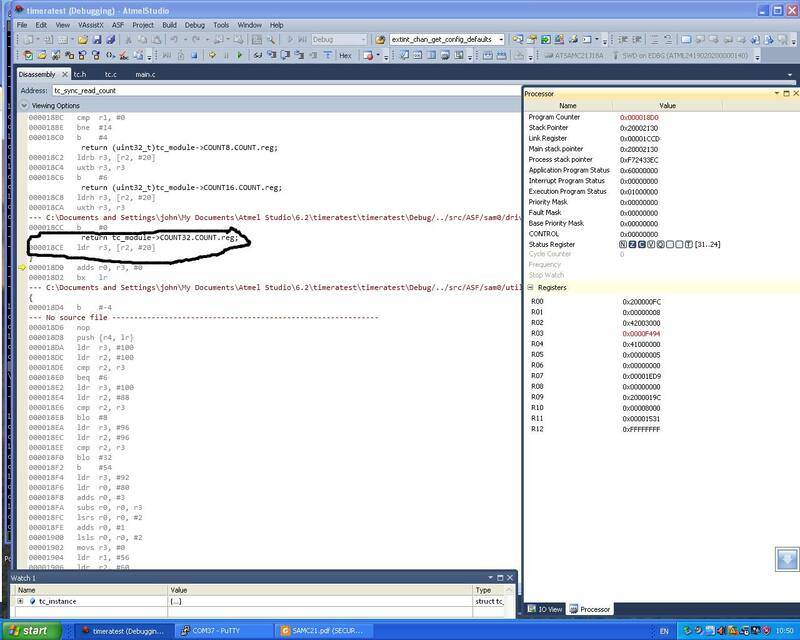 In the upper left the debugger did enter the TC_COUNTER_SIZE_32BIT return. In the lower left, the 32bit counter only has a 16bit value. on the upper right, the mode is set to 32bit. Another screenshot of the debugger. Upper left. Assembly to load from counter into R3. On right see R3, only has a 16bit value. Still can't get the 32bit value to show. Happy to say I found the problem. 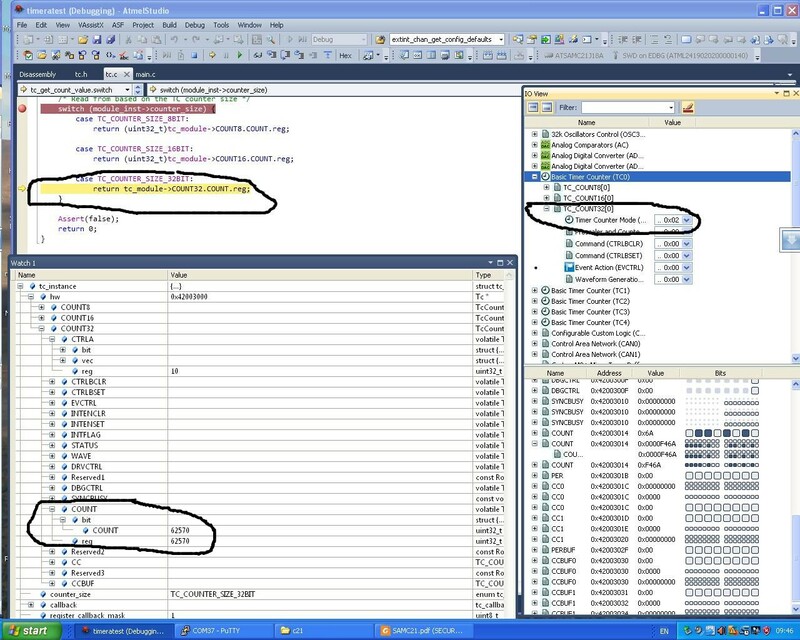 In ASF tc.c there is an error on indexing into an array for values to be used setting up the MCLK timer for the slave TC. I must say that it is 2 for 2 on errors in the ASF Example code. In the Tsens code and in the TC code. I know this is an old post, but I just want to point out the above is still an issue 2 years later in the most recent version of asf (3.35.1) to date and this fixed it. Thank you for the information, they are very helpfull. You also mentioned that there is a bug in tsens code also! Can you please say where is the bug, because I want to use internal temperature, but he values are not correct. I suspect that there is something wrong with configuration of tsens, but for now I did not found the solution. You also mentioned that there is a bug in tsens code also!